Once upon a time, a long time ago, the Everything-Maker was very busy, making all the animals and all the plants and all the rocks and caverns and everything else that covered the earth. Owl waited for his turn. He had been given a voice, two eyes, a head, a body, and strong wings. 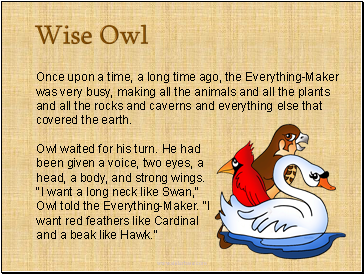 "I want a long neck like Swan," Owl told the Everything-Maker. "I want red feathers like Cardinal and a beak like Hawk." "Yes, yes," mumbled the Everything-Maker. “Whatever you want. But you must wait your turn." The Everything-Maker looked sharply at Owl. "Your eyes are open again. You know that no one is allowed to watch me work. Turn around and close your eyes. I have no time for you now. 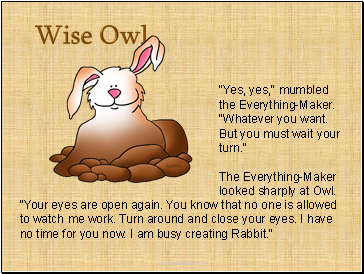 I am busy creating Rabbit." 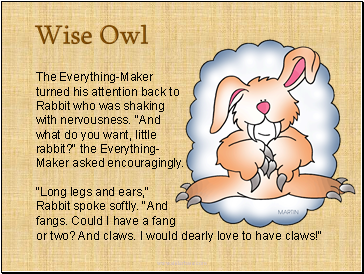 The Everything-Maker turned his attention back to Rabbit who was shaking with nervousness. "And what do you want, little rabbit?" the Everything-Maker asked encouragingly. or two? And claws. I would dearly love to have claws!" The Everything-Maker smiled. "I think we could manage some claws and fangs." He smoothed Rabbit's long legs and ears. 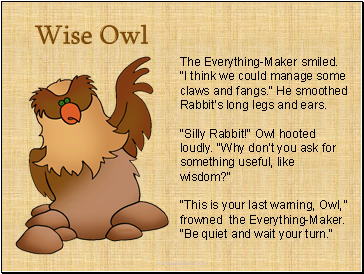 "This is your last warning, Owl,” frowned the Everything-Maker. “Be quiet and wait your turn." 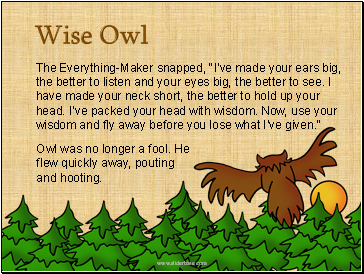 Owl glared at the Everything-Maker. "You have to do it," he hooted. "You have to give us what we ask. I demand wisdom!" 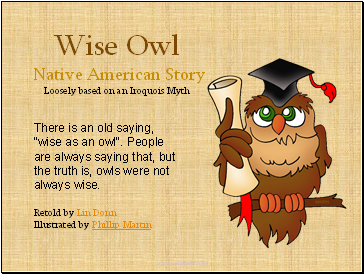 "I warned you, Owl!" shouted the Everything-Maker. 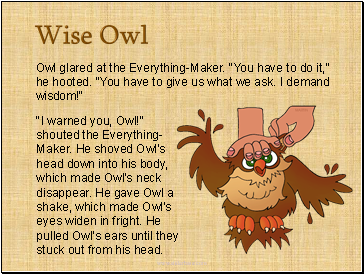 He shoved Owl's head down into his body, which made Owl's neck disappear. He gave Owl a shake, which made Owl's eyes widen in fright. He pulled Owl's ears until they stuck out from his head.